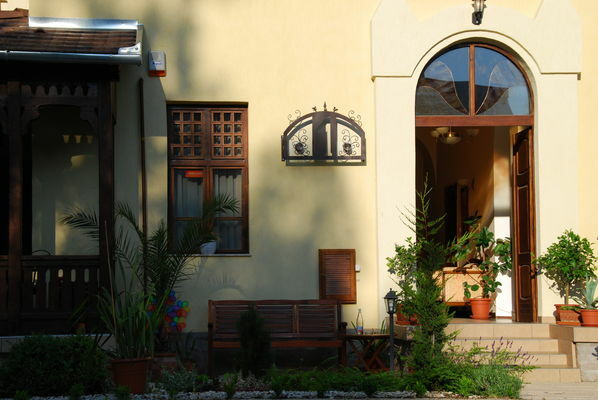 The Villa Campana is located in Siófok at the golden beach in the Köztársaság street in the surroundings of trees from the turn of the last century. The holiday home was built at the end of the 19th century for an upper-class family from Budapest. During the last more than 100 years it had a lot of owners. After the socialisation in 1947 it was used as a guest-house until 2003. With the reconstruction of the whole building done in 2007, we attempted to preserve the original style of the house. For example, we tried to put back into initial condition the most of the windows and doors and the wood decoration of the house. After the renovation the house got back its original 20th century peaceful atmosphere. The house is equipped with all comfort which satisfies also the most demanding people. The newly completed house waits for its guests from the end of June on throughout the whole year. The house is optimal for circle of friends and families. 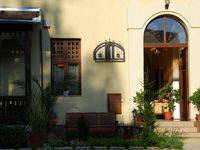 The villa is situated in the most tourism-frequented quarter of Siófok 50 metres away from Lake Balaton. The Petöfi promenade is in immediate neighbourhood and you can be in the city centre of Siófok in 2 minutes by walking. You can also find many sport and pleasure possibilities in direct neighbourhood. In the villa there are 9 spacious rooms for high demands with bath, colour-TV, ISDN-telephone, unlimited Internet-access and refrigerator. The rooms can be provided with an additional bed. Three rooms are suitable for families with 2 adults and 2 children. Some of the rooms have a considerable big balcony. On the ground floor next to the reception an impressively equipped saloon is waiting for its guests where they can spend nice evenings in the atmosphere of the beginning of the 20th century. In our own garden we ensure free of cost a secure and closed parking space for the cars of our guests. • Half board is available at 3900 HUF per person. • Wireless Internet access is available in some rooms. • Pets are allowed for an extra charge of 2900 HUF per day. • Reservations can be cancelled free of charge up to 14 days prior to arrival until 18:00.